The Korey Stringer Institute actively conducts research at the University of Connecticut laboratories within the Department of Kinesiology. KSI’s research focuses include thermal stress, hydration, wearable devices and elite athlete performance. KSI also performs field research and survey at various sites around the United States. Brainscope- Current concussion diagnosis and recovery has been dictated largely by subjective or participant driven evaluation. New tools are constantly being developed to aid clinicians in their decision making process. One such tool currently being developed is the BrainScope Ahead® system. KSI was part of a national multisite, recently completed study funded by BrainScope and the Department of Defense, to aid in the development the algorithm for the concussion device. Currently, athletes are being enrolled for the second phase of the study to validate this device. SHIRT- Shirt and Hat Influence Rise in Temperature – The KSI research team is testing three types of shirts and two types of hats to see how they affect people during exercise in the heat. We want to know if these garments affect physical performance, cognition, mood, body temperature, or heart rate. Athletes, laborers, and soldiers could be able to choose garments that help them maintain their performance and reduce the risk of heat illness while exercising or working in a hot environment. HydraCoolEs – The KSI team investigated the influence of hydration, hand cooling, and a combination of both during exercise recovery in the heat. We wanted to see if a person stays hydrated during exercise in the heat if they cool quicker than if they finished exercise dehydrated. Medical Tent Prediction – The KSI staff investigated predisposing factors that lead to road race participants entering a medical tent for exertional heat illness care. Falmouth Road Race 2014 – KSI staff conducted a field study to investigate training characteristics of road race runners and predisposing factors that may contribute in the risk of sustaining exertional heat stroke during the road race. We also examined the use of ingestible thermistor on the field setting to validate its efficacy. COOL-IT – Cooling Off Optimizes Lowering Internal Temperature – The KSI research team studied the effects of a head cooling device on whole body cooling. This can potentially help athletes and military workers who are active in hot climates to maintain performance and decrease the likelihood of heat injuries. CATCH ON – Collaboration for Athletic Training Coverage at High schools: an Ongoing National survey – Private Schools– As part of an initiative by the National Athletic Trainers’ Association, KSI along with the NATA secondary schools committee are researching medical care in high school athletics, specifically the presence of an athletic trainer, in every high school in the United States. This study requires KSI to place thousands of phone calls and emails in an effort to communicate with every private high school athletic director in the country. CATCH ON – Collaboration for Athletic Training Coverage at High schools: an Ongoing National survey – Public Schools– As part of an initiative by the National Athletic Trainers’ Association, KSI along with the NATA secondary schools committee researched medical care in high school athletics, specifically the presence of an athletic trainer, in every high school in the United States. This study required KSI to place thousands of phone calls and emails in an effort to communicate with every public high school athletic director in the country. KSI presented the results in the summer of 2013 at the National Athletic Trainers’ Association national conference in Las Vegas, NV. Effects of Hand Cooling on Thermoregulatory Strain in Football Players – The KSI team is studied the use of RTX hand cooling devices on thermoregulatory strain and athletic performance. The goal was to determine if this device should be used to decrease core body temperature in exercising individuals in a stressful heat environment. Pacing Strategies in Novice Runners – Sponsored by Timex, we studied changes in pacing ability in overweight male novice runners over the course of six weeks of run training. Additionally, we looked at changes in cardiovascular risk factors, weight loss, and insulin response. 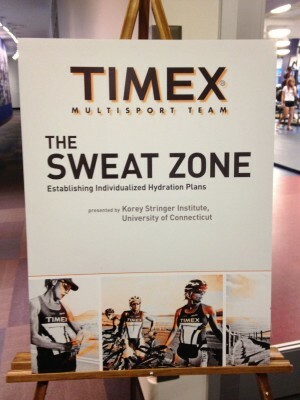 Kona Ironman Triathlon 2012 – The KSI team traveled to Kona, HI to help Timex by evaluating immune function, post-race cooling, and pacing stragegies of elite triathletes. Data was collected on over 30 participants and is currently being analyzed. Lake Placid Ironman Triathlon 2012– KSI also recently collected data at the 2012 Lake Placid Ironman Triathalon in Lake Placid, NY. KSI collected data on hydration status, pacing, and mood from elite triathletes who practice different pacing strategies. Data collection will continue at the 2013 Lake Placid Ironman Triathlon. NY Giants – As part of a multi-year agreement with Timex, KSI performed research with the New York Football Giants during offseason conditioning sessions over 9 weeks in 2012. During these sessions, hydration status was assessed using urine analysis and body mass. Performance was assessed using heart rate and other performance data collected with a Timex Run Trainer GPS techometer. Data on mood and diet was also collected. This data is currently being analyzed and prepared for publication. Timex Triathlete Training Camp 2012– At the Timex training camp held at the Timex Performance Center, wecollected data on elite athletes from the Timex multi-sport team. Data included measures of heart rate, hydration status, sweat rate, and sweat electrolyte composition. This data is currently being analyzed and prepared for publication. Kona Ironman Triathlon 2011– KSI collected data at the Ironman Triathlon World Championships in Kona, HI as part of an agreement with Timex. The first year of data collection at Kona was completed in 2011, collecting data on over 30 triathletes. KSI evaluated hydration status, pacing, and sweat electrolyte content. The team returned to collect a second set of data at the 2012 Kona Ironman Triathlon World Championships. UConn Men’s Soccer – Research involving elite collegiate men’s soccer is currently very limited. During preseason training in 2011, KSI performed research on the athletes of the Division I University of Connecticut men’s soccer program, ranked #1 in the country. KSI examined hydration status, diet, hormonal response, mood, and measures of performance including heart rate, and on-field measures using two GPS devices. Data from this research is currently in publication.